PennsylvAsia: Nanoha (魔法少女リリカルなのは Reflection), A Silent Voice (聲の形) screenings cancelled as Hollywood Theater in Dormont closes. Nanoha (魔法少女リリカルなのは Reflection), A Silent Voice (聲の形) screenings cancelled as Hollywood Theater in Dormont closes. 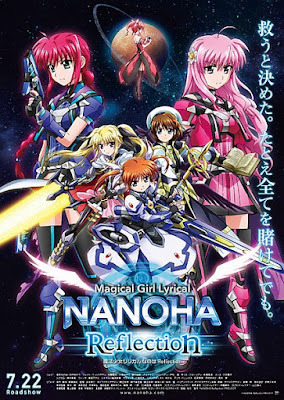 Trigun: Badlands Rumble (トライガン バッドランズ ランブル) in 2011; Magical Girl Lyrical NANOHA Reflection (魔法少女リリカルなのは Reflection) was scheduled to play tonight and Wednesday. The Friends of the Hollywood Theater, which had been operating in the the Hollywood Theater in Dormont, announced this evening that it has ceased programming and closed its doors as of Sunday, February 11. It is with heavy hearts that we are announcing that Sunday, February 11th was our last day of programming, and after settling our obligations with the previous building owners, we will be fully vacated from the premises by Wednesday, February 14th. The full statement on the theater's website indicates it may reopen in a different capacity in the future. The Hollywood Theater was one of the few venues that played both new and classic Asian movies, and was long the only place around that would screen new anime releases.